The fact one outsmarted Death was the cause of a lot of trouble in “Final Destination“, resulting in a whole series of victims. Recently I saw “Wish upon” with a Chinese music box falling into the hands of a teenage girl. A music box she used to fulfill certain wishes. Only this wasn’t without consequences and individuals here also died in gruesome circumstances. 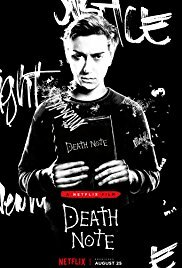 “Death note” is again a variation on the subject. Here it’s the student Light Turner (Nat Wolff) who gets a mysterious notebook thrown into his lap. Whose name is written in it, is doomed to die. And this notebook is accompanied by Ryuk. A kind of hedgehog-like God of death who passes on the notebook if necessary and ensures that the rules described in the booklet are strictly followed by the owner of the book. Light Turner sees an opportunity to rid the world of unwanted criminals. Praiseworthy and noble, but of course not without consequences. Before Light realizes it, the entire police apparatus is behind the mysterious murderer of scumbags from all over the world. I guess you’d better skip it if you know the original manga. Admit it! It sounds promising after reading the storyline. Well, I thought it sounded interesting. An original concept with plenty of possibilities to make it a breathtaking and extremely exciting fantasy story. And actually they largely succeeded in it. Provided you aren’t a fervent fan of the Japanese manga this film is based on. After reading a bit about the subject on the worldwide web, I can imagine that this film version feels somewhat limited compared to the original manga. The original story in that manga is being spread out over 108 chapters and bundled in twelve manga booklets. That’s why this movie seems so chaotic and the story flashes past you in a rush. In retrospect, it wouldn’t be such a bad idea if they had made a series of it. The book “The Hobbit” only has about 200 pages and yet Peter Jackson managed to produce roughly eight hours of film to tell this tiny story. If one extrapolates this to this manga, this would probably result in rougly 100 hours of footage. An amusing little Netflix flick (provided you don’t compare it to the original). Fortunately I’m a complete nitwit when it comes to Japanese manga and I can judge this film without prejudice. I have amused myself with it. Not only did I find the concept intriguing and at the same time it was frightening how Light has control over someone else’s life, simply by putting a name down in a notebook. You can also expect some bloody scenes (“Final destination“-like) when an unfortunate victim dies. I thought Nat Wollf was convincing enough as the somewhat timid, bullied student who slowly grows into a merciless avenging angel. His girlfriend Mia (Margaret Qualley) has a fairly limited role and didn’t impress me so much. Ryuk is by far the most interesting character. It’s largely a CGI creation. But thanks to the magnificent voice-over by Willem Dafoe, the entertainment factor of this mythical figure rises swiftly. The most disappointing character was L. (Lakeith Stanfield). A mysterious, young detective who’s just a few steps behind Light. But I’ll always remember him as the masked dude who maintained a peculiar seating position. Japanese series … No thank you. For a moment I was playing with the idea to watch the original manga one day. I think there’s little chance this will ever happen because I dislike series and Asian-oriented cultural objects aren’t quite my sort of thing. But I’m convinced the story will be far better and more intriguing. However, you’ve never seen the original? No harm done if you’d choose to watch this little treat. The film has my interest. It’s a name I’ll be adding to my dvd list.